There are many wonders and facts about the nature surrounding us. Many things we don’t know and many things we would like to know. In this article, we will review some of the most amazing unknown facts about the tallest towers in the Middle East and Asia. Always topping all lists are the two highest skyscrapers in the Middle East; Burj Khalifa and the Mecca royal clock tower; both with a total height of 828 m and 601 m respectively. Did you know that Burj Khalifa has a very advanced cooling system to the extent that the water gathered from its air-conditioning system can be equal to 20 Olympic sized swimming pools in a year? 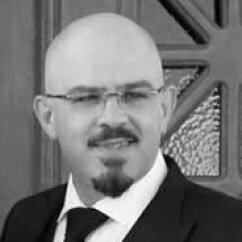 Also, in the past, the height of the international commerce center in Hong Kong was revised several times before finalizing it because the authorities in Hong Kong didn’t allow any towers to be higher than the mountains surrounding the city. It’s weird what a small change in the design of a tower can cost. The majority of people usually would assume that a small design change in a tower or in a building cannot by any means cost a fortune but this is exactly what happened with the Shanghai World Financial Center. After deciding on the final design, the group of architects responsible for designing it decided to change the design of this building which resulted in an extra $200 million to be paid due to the advanced designs they agreed on implementing. 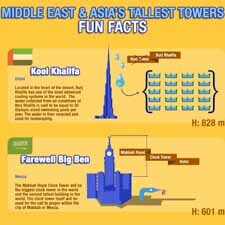 Tallest Towers in the Middle East & Asia carry some funny facts. Click for a bigger size. The information of this infographic was collected from several studies and news sources that were opened to the public throughout the past couple of years. Official source of the infographic.